If you’re going to call your album Monolith, then you better make sure it sounds huge. Thankfully Norway’s From Beneath Billows have produced an absolutely monumental record that really lives up to its title. A five-piece from Oslo, From Beneath Billows have been active since 2005 and this is their second full-length record. With Monolith the band has made a sprawling, all-consuming record which sits somewhere between atmospheric, graceful post-rock and blistering metal assaults. Lars Kristian Jagtøyen and Bjørnar Børja’s duel guitars create heady, intricate tapestries always a few chord changes away from heavy-as-heaven riffage. It’s a balance which keeps you glued to the speakers, complimented perfectly by the adaptable vocal abilities of singer Lars Sundsbø. Sundsbø flits between an almost meditative rock croon and throat shredding, guttural screams throughout these labyrinthine compositions. It’s these apparently simple juxtapositions which make the album such a compelling listen. Take opening track ‘One Death and the Kings’, for example. The track begins with a brooding, simple guitar part setting the scene for an almighty 12-minute epic. The music gradually unfurls, revealing itself in stages. It’s an impressive piece; from the almost prayer-like singing from Sundsbø near the beginning to the unexpected onslaught of riffs and intense screams around the halfway mark. It’s all played fairly straight-faced and some may crave a little more playfulness from their metal, the kind offered by Melvins and Boris. However, if you can stomach the unrelenting darkness, Monolith is a great record. 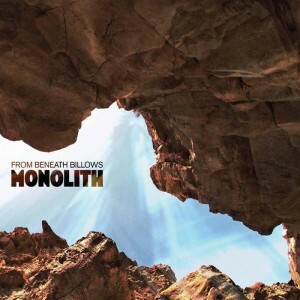 From Beneath Billows clearly could have been a decent metal band or a decent post-rock outfit but have become something far more engaging with this record. Taking those ever-so-restrictive genre labels and tearing them up, Monolith is a big, heavy (serious) and rather clever album.